The Best Motocross blogs from thousands of top Motocross blogs in our index using search and social metrics. Data will be refreshed once a week. Also check out Motocross Podcasts and Motocross Youtube Channels list for Top videos on motocross. Motorcross newsletter is a comprehensive summary of the day's most important blog posts and news articles from the best Motorcross websites on the web, and delivered to your email inbox each morning. To subscribe, simply provide us with your email address. About Blog The world's top source of motocross and supercross news, videos, features, and photos. The most frequently updated site in motocross. Facebook fans 1,020,025. Twitter followers 165,406. About Blog Vital MX is your #1 source for dirt bike reviews, AMA Supercross racing, motocross, motocross gear reviews, videos. Meet other motocross riders in the Vital MX community. Facebook fans 113,257. Twitter followers 53,918. California About Blog Transworld Motocross is written for racers, by racers. TWMX brings you the latest Supercross and Motocross news, bike and gear tests, motorcycle reviews, videos, racer profiles, freestyle photo galleries and more. Motocross videos of event recaps and interviews with pro motocross racers. Learn motocross tricks from our how to videos at Transworld Motocross. Facebook fans 1,801,873. Twitter followers 137,999. Valencia, CA About Blog Motocross Action is a monthly publication focused on providing motocross-specific information, including bike and product tests, race coverage, technical features, personality stories and events that are both current and nostalgic. Facebook fans 378,253. Twitter followers 16,213. Bath UK About Blog The Latest Motocross, Supercross and MXGP news, including interviews, vidoes and exclusives from across the world. Facebook fans 580,929. Twitter followers 22,546. Canada About Blog MXP Magazine embraces the Canadian motocross lifestyle! MXP Magazine shows no limits by featuring top riders, products and events in every issue along with amateur profiles and the hottest industry trends. Facebook fans 37,031. Twitter followers 5,704. Morgantown, WV About Blog MX Sports Amateur, servicing the administrative needs of the athletes, teams and sponsors of the Amateur National Motocross Championship at Loretta Lynn's. Facebook fans 206,926. Twitter followers 18,668. About Blog I got my first dirt bike when I was 4 years old and ever since then I've had the privilege to be around dirt bikes and motocross riders. The 20-years of experience has taught me a lot about dirt bikes and riding gear. I started this blog to write unbiased motocross related reviews so I could help my fellow motocross riders make better purchasing decisions. Blog by Martin. Camarillo, CA About Blog BTO Sports is your number 1 source for all of your motocross needs. BTO Sports offers a wide range of Dirt Bike gear as well as having the widest selection of online Motocross parts and accessories from all the top Moto brands. Our Mission is to make our customers happy and support them to be the best riders they can be. Facebook fans 234,703. Twitter followers 5,203. United Kingdom About Blog Europes leading English speaking Motocross website. Our mission is to make our sport better. Facebook fans 9,400. Twitter followers 1,549. Australia About Blog Foremost Media is an online publishing specialist within the Australian motorcycle industry when it comes to delivering diverse, relevant content and successful marketing solutions. Facebook fans 235,161. Twitter followers 9,187. About Blog Latest MX Videos, Just isn't videos, It's News-Pictures-Videos! Our mission is to be the worlds number 1 leading source of Motocross entertainment. Facebook fans 271,655. Twitter followers 27. United States About Blog PitRacer's mission is to support and grow the sport of motocross from the grass roots amateur level all the way to the true heros of our sport, the privateer. Facebook fans 12,151. Twitter followers 1,827. Facebook fans 230,647. Twitter followers 10,239. Canada About Blog Direct Motocross for all your news, photos, videos, and information about Canadian motocross, arenacross, off road, and supercross. Facebook fans 12,522. Twitter followers 16,471. Tim Ferry's attic About Blog Steve Matthes is a Canadian-born dude living in Las Vegas and trying to make a living being a freelance journalist covering the supercross/motocross world. I currently Editor-at-Large for Racer X (on-line and magazine), Motocross Magazine (in Italy) and some other countries that I may not even know about. Facebook fans 8,676. Twitter followers 39,673. San Francisco, CA About Blog Our reddit motocross fantasy group can be found on motoxracing.com under the group name "reddit. Facebook fans 1,163,948. Twitter followers 521,924. About Blog Blog by Ryan Gauld, I’ve been racing motocross and involved in the industry for 30 years. The one stop hot spot for Canadian MX information. The site is dedicated to the racer, the family that supports that racer, and the dream that racer has to become the best he or she can be. Facebook fans 17,541. Twitter followers 4,906. About Blog This Blog will keep you up to date with all the additions and changes to Your Adrenaline Fix Serving Motocross, Off-Road and FMX Enthusiasts. UK About Blog Trials and Motocross News is Britain's national newspaper for trials and motocross since 1977. Get All the latest motocross news, British motocross video, MXGP results and Maxxis standings from Britain's leading off-road weekly newspaper. Facebook fans 24,023. Twitter followers 5,642. About Blog GateDrop.com is your motocross and supercross magazine website. We provide you with the latest breaking news and videos straight from the MX/SX industry. Facebook fans 20,195. Twitter followers 1,022. San Bernardino, CA About Blog Glen Helen Raceway opened in 1985. Since, its had several Off Road & MX events throughout the years. Facebook fans 45,823. Twitter followers 1,930. About Blog Welcome to the Team Rocky Mountain ATV/MC-KTM-WPS home page. Here you can find information on the team, photos and videos from the 2017 and the 2018 racing season. The team comes into the new racing season with confidence and is ready to win, competing in the Monster Energy Supercross series and the MX Sports Pro Motocross Outdoor Championship. Facebook fans 1,740. Twitter followers 473. Florida About Blog Unlimited Sports MX is the promoter of the Florida Gold Cup Series, Florida Winter Am Series and the Winter Olympics (aka the Mini Os). Stay up to date on the latest news surrounding all of Unlimited Sports MX events. Facebook fans 6,086. Twitter followers 422. Australia About Blog The Motul MX Nationals is Australia's premier motocross championship. The 10 round series will travel across the country to crown Australia's best riders. Facebook fans 778,837. Twitter followers 3,112. Salisbury, England SP2 7PY About Blog Holeshot Motocross Kawasaki are the Souths largest off road motorcycle dealer, supplying high quality used motocross, enduro, trials, children’s quads and bikes. Holeshot Motocross prides itself on a great level of customer service and with our staff out on the MX scene daily, you can be sure we know what’s new and what’s in the pipeline before many others! Facebook fans 10,970. Twitter followers 111. Loretto P.A. About Blog We are 110% commited to your motocross racing success with are motocross school, fitness training, & tips. Even if you have the motocross bug in your heart but never threw a leg over a dirt bike, we will help teach you how to ride. If your a racer already & want to improve your skills whether it be in fitness, riding skills, mental, or all three we will get you to the top of the pack. Facebook fans 3,163. Twitter followers 49. About Blog View the latest racing results from India. We cover Motocross, Autocross, Dirt Bike, Rally and all other Motorsport series. Facebook fans 6,067. Twitter followers 888. About Blog Welcome to the Florida Series Website for Motocross racing news. Mechanicsville MD About Blog Our Motocross Track in Southern Maryland, USA is open for all racers and riding levels. Facebook fans 38,230. Twitter followers 994. Morgantown About Blog ATV Motocross National Championship, presented by CST Tires, an AMA National Championship, America’s most prestigious and longest standing ATV racing series. Facebook fans 54,121. Twitter followers 6,017. About Blog Promotion of West Australia's Senior & Junior State Motocross Championship. Facebook fans 3,098. Twitter followers n/a. About Blog Since 2010, the group has been managed by past Supercross and Motocross champion Mike LaRocco. LaRocco spent the last seven seasons of his career with Factory Connection Racing and is credited with elevating the team to the top level of the sport. LaRocco’s knowledge and experience has provided a winning perspective to the team and gives the young riders a valuable mentor to guide their careers. Facebook fans 37,485. Twitter followers 39,401. About Blog PerthMX is a Australian website featuring motocross and motorcycling news, discussion, photos, reviews, videos and more!. Facebook fans 152,526. Twitter followers n/a. Rugby About Blog Motocross World Online is a natural progression in keeping up with the constantly increasing demand for our products and services. Motocross World Online for the comprehensive online shopping experience,Parts and accessories for Motocross bikes complete Honda part finder, quick and easy. Facebook fans 2,070. Twitter followers 842. Arizona About Blog Online Training from a Proven Winner and Coach.Teaching all ages a faster safer way to ride and race motorcycles. Written by Justin Buckelew, San Diego Supercross Winner Four AMA Supercross podiums Prince of Bercy 2000 Three top ten AMA national finishes. Has helped over 500 riders increase their skills and performance on the track, with over 30 AMX State Championships…and counting! Facebook fans 97. Twitter followers 17. Manitoba, Canada About Blog The Manitoba Motocross Association is a membership driven organization committed to the growth and development of competitive off-road motorcycle racing, for amateurs and professionals in Manitoba. Stay up to date on schedule changes, special events and more! Facebook fans 1,667. Twitter followers 521. Orange County, CA About Blog We are Motocross Ministry, a Bay Area based racing academy that offers affordable and quality motocross camps, clinics, and events for youth in Northern California. We provide racers with the opportunity to learn from the best, not only through developing racing skills, but life skills as well. Sharing the love of Jesus through motocross. Facebook fans 163. Twitter followers 105. About Blog The Hawkstone International is one of the UKs biggest attended motocross events and is the opening and start of the UK motocross season. The Hawkstone International will give the fans an opportunity to some of the World’s best riders in the UK. Facebook fans 14,341. Twitter followers 3,185. About Blog It's not just a race, it's an event! Facebook fans 7,222. Twitter followers 60. Stanton, Michigan About Blog Morelands Supercross Park is located on 33 acres of natural northern terrain. Soil conditions on the MX track are mostly clay with some sand. The MX Track features excellent drainage for speedy recovery after rain events. The track is designed for all riders ranging from beginner to pro and suitable for all ages. Facebook fans 9,249. Twitter followers 90. About Blog Big Air motocross, Michigan's premiere motocross track located in Newaygo Michigan! Our mission is to promote a fun, competitive, and family atmosphere for all ages! Facebook fans 7,368. Twitter followers n/a. About Blog The Ultimate Moto course using MX tracks, woods trails, and grass fields, Last round of the WNY GP hare scramble series! Facebook fans 7,304. Twitter followers n/a. New Jersey, USA About Blog Motocross racing in and around the Garden State of New Jersey. Past, present, and future. The site aims to provide users a complete look at all things related to New Jersey motocross. The site contains images, video, articles and results about racing past, present and future. Facebook fans 3,722. Twitter followers 2,153.
baldwinville, MA About Blog Stay updated with latest news on MX Practice & Race Facilty by Crow Hill MX. Facebook fans 4,105. Twitter followers 137. Manchester UK About Blog Ashley Wilde 704 Motocross athlete riding for RFX KTM. Facebook fans 2,561. Twitter followers 2,127. About Blog Sedlak Offroad School is a professional Motocross and Enduro school. We are offering world wide trainings, tours and ride days for Motocross, Dual Sport and Adventure bikes. About Blog Pit Pro Cycle MX specializes in all your Parts accessory and service needs for all your dirt /sideXside/quad and Street adventures. We carry all the top Motocross brands and carry a wide selection of helmets, jerseys, pants, toys and gifts. At PitPro, we strive to bring you the best Motocross experiences serving Santa Clarita for Motocross repairs and Motocross parts for over 20 years. California About Blog Find the latest Veteran Motocross news, events, health tips, videos, photos, products and rider profiles. About Blog A forum for mothers of MX racers to find and share information. New Jersey, USA About Blog The one stop source for all motocross related press releases. Facebook fans 21. Twitter followers 4. About Blog Race Ohio MX began with a small group of us (Scott Plessinger, John Walters and Rick Landis) seeing the increasing number of riders wanting to ride and or race in southern Ohio. This vision includes helping to promote the sport and consistency among the all of the tracks and promoters. About - The Latest Motocross, Supercross and MXGP news, including interviews, videos and exclusives from across the world. About - TMX is the world's leading off-road weekly newspaper. Motorcycle Trials, Enduro News, Motocross and Race Results. Sell Dirt Bikes for free. Get All the latest motocross news, British motocross video, MXGP results and Maxxis standings from Britain's leading off-road weekly newspaper. About - A legal permit issuing body for off-road sport in the UK, permitting in excess of 1,000 off-road events every year! Motocross, Trials, Enduro, Scrambles. 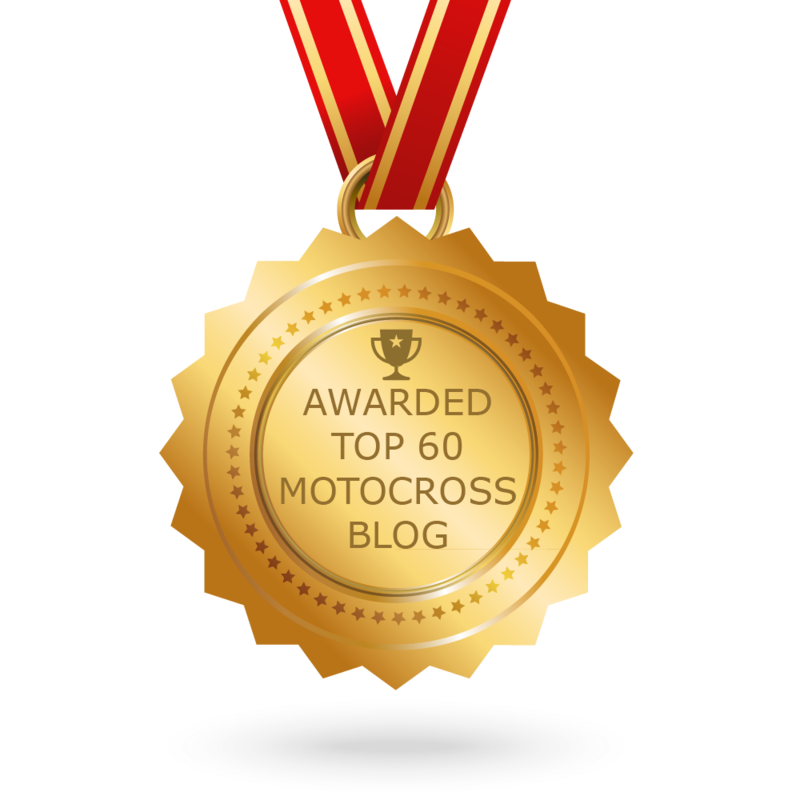 CONGRATULATIONS to every blogger that has made this Top Motocross Blogs list! This is the most comprehensive list of best Motocross blogs on the internet and I’m honoured to have you as part of this! I personally give you a high-five and want to thank you for your contribution to this world.